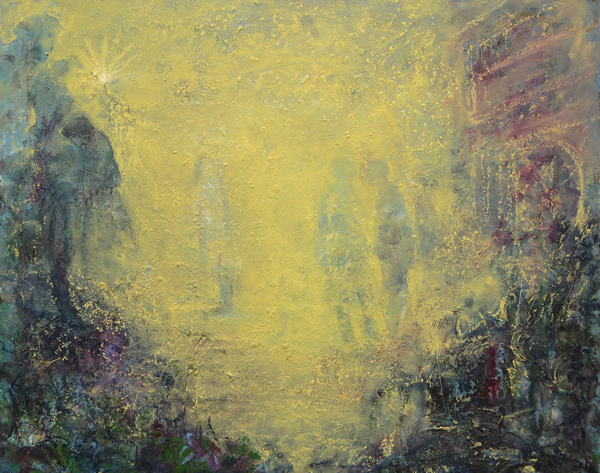 The four artists are long-time friends and colleagues connected by similar themes and aesthetics in their work. Waine Ryzak is a celebrated glass artist with an international clientele. For many years she attended summer workshops at the renowned Pilchuck glass school founded by Dale Chihuly. Ryzak brings both glass sculpture and watercolour paintings to the show. “I like the immediacy of watercolours,” she says, “the handmade cotton paper is easy to transport and a delight to work on.” In Scythian Memories the artist makes reference to past civilizations in the overflowing relic. Small clashing figures, fragments of text and symbols, ritual food and drink, all spill from the vessel. The watercolour has a companion cast-glass piece: a small amber chalice. In the monotype print Clashing Cultures the artist used layers of oil printing ink to express the theme. The war-like Greek figure, shield in hand perches on a column. At left, the footprint of Buddha symbolizes the wisdom of right action contained in the teachings of the Dharma. Many of Ryzak’s images refer to elements found in nature and shapes of earth energies such as the circle and spiral. The nature of light as it moves through glass is a sacred preoccupation for the artist. Ancient cultures, archetypal themes, myth and magic ignite her imagination and creative output. 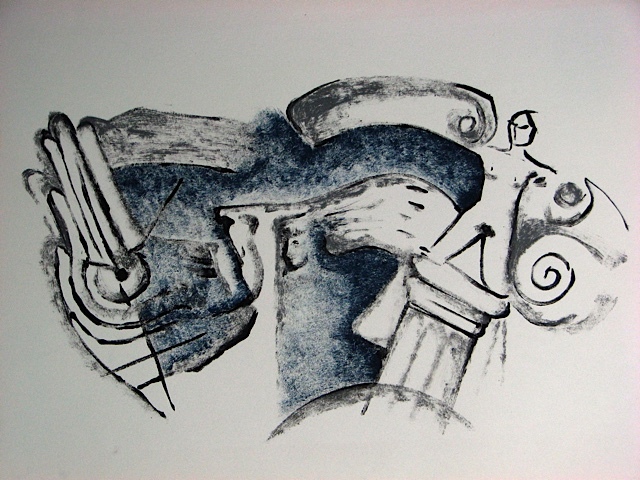 Clashing Cultures, 12x18 in, oil monotype, 2010. Heather Keenan doesn’t need to travel for adventure. Her dreams are replete with people coming and going in cavernous spaces, resembling train stations or city squares. “Sometimes, I wake up tired from all the activity,” she says. Keenan’s background includes training in design, drawing and art administration. Her current art practice evolved from early pen and ink drawings, an intuitive style of mark-making much like doodling. Keenan now uses oil paint sticks to make her paintings, which vary in size from miniature to oversize. Payne’s grey and dark crimson are favoured hues. Oil paint sticks have beeswax mixed with their pigments. “I work with the medium building up layers of pigment,” she says, “and find that matter holds a mystery, an inherent energy.” What emerges is often a surprise to the artist. She has learned to let the images form without a lot of conscious intervention. And not to labour too long if something isn’t working. The artist looks forward to dedicating her life to painting after she retires in a few years. Miles Lowry is a multi-disciplinary artist with both paintings and sculptures in the show. His new series Heroes and Orphans focuses on the human figure, in two and three dimensions. For Swimmer, Lowry layered water colour on mulberry paper using a combination of underpainting, layering and detailed brushwork. The cropped close-up of the subject’s face suggests a mysterious and ambiguous presence. The artist is fascinated by how people experience the subtleties of human expression in portraiture. How light transforms objects and creates moods is the subject of Lowry’s work. He focuses on the fleeting, ever-changing nature of light; the moment of illumination before fading into shadow and disappearing. In Deep Water Fragment Lowry suggests a perilous narrative of sculptures lost in shipwrecks, returned to the surface. “I let the broken pieces tell a story,” he says, “open to the viewer’s interpretation.” Lowry uses a live model for cast cotton works and has perfected his process. These fragmented human forms are aged to perfection via paint and mediums. Lowry’s sculptures are delighting collectors at the Grantfield Gallery in Tuscany, Italy. In 2007, Vince Klassen’s Door Series appeared with Ryzak’s work at Martin Batchelor Gallery. For the current exhibition, he produced new Palladiotypes in his custom dark room. This style of platinum print making uses large format negatives and chemical emulsions to hand coat paper. The images develop via UV exposure and offer a textural, mid-range tonality not found in traditional black and white prints. The platinotype technique was invented in 1873. Many 20th century photographers such as Irving Penn used the complex procedure to great effect. Klassen frequents auctions looking for these classic images. Most of these rustic and historic doorways were photographed in Germany and Italy. “Doorways are enigmatic,” says Klassen, “because they suggest passage ways, spacial changes and new directions.” The Zur Krone door has an ancient rounded shape and some interesting graffiti on surrounding walls. The barrels and arrow indicate the Krone brewery, founded in 1597, is nearby. A modern element is introduced by the stencilled words “Revolution Rock” below the arrow. Klassen’s fondness for Italy includes the traditional landscapes, rolling hills and medieval walled cities. 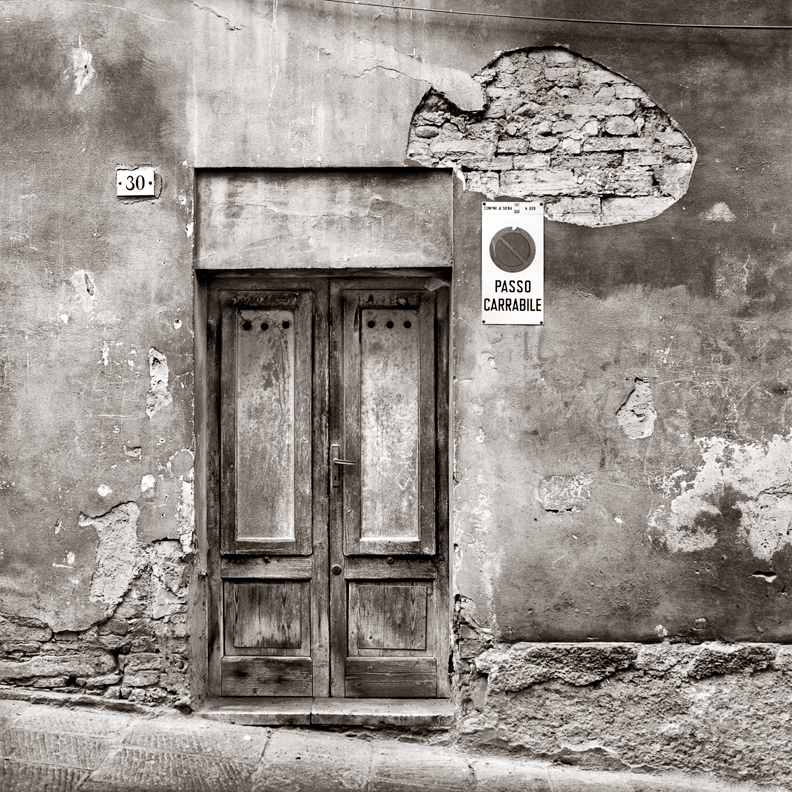 In Door #30, Italy, the crumbling exterior of the weathered wall is oddly emblazoned with modern signage (no parking). “I find that visual ambiguities add humour and interest to photographs,” he says. 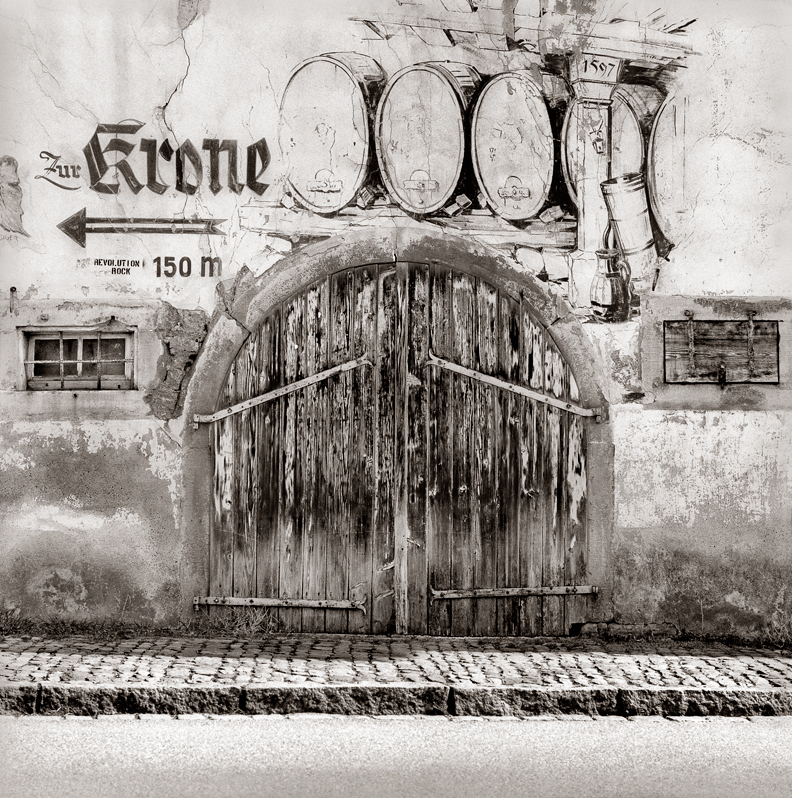 Door “Zur Krone” Germany, 16x16 in, palladium print. Door #30, Italy, 16x16 in, palladium print. Web Design and Content by Kate. Photos courtesy the artists.